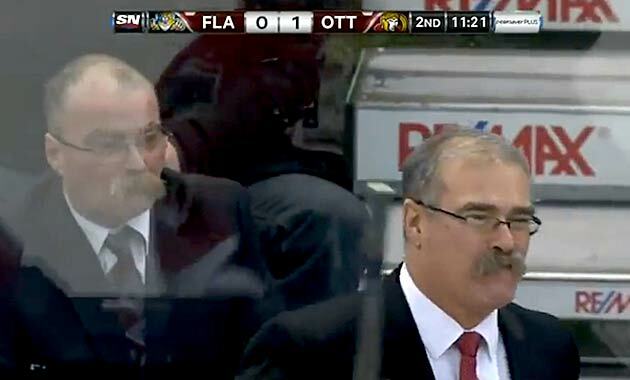 Paul MacLean's press conference, Maple Leafs deodorant Zamboni among NHL's zaniest moments of 2014. 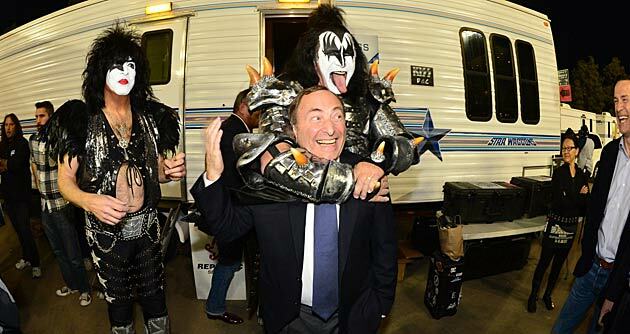 SI photographer Robert Beck took the hockey photo of the year when he snapped Gary Bettman in the warm embrace of Kiss bassist Gene Simmons at the NHL's Stadium Series game between the Ducks and Kings at Dodger Stadium in Los Angeles. The commissioner made the scene by hanging out with "the hottest band in the world" after it opened the festivities with rousing renditions of "Rock and Roll All Nite" and "Lick It Up." The revelation of the year was provided by Canadiens defenseman P.K. 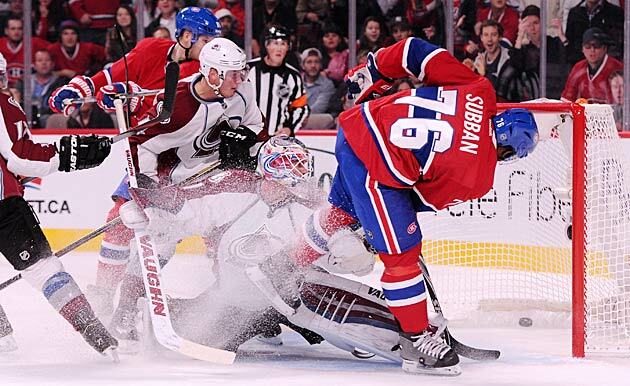 Subban, who disclosed to Radio Canada's Tout le monde en parle in October that he tweaks his pregame diet with protein and coffee in order to generate as much flatulence as possible and then unleashes gas attacks on unsuspecting goalies during games. Scorch may have been a hot idea for the AHL team's new mascot, but his introduction video sparked outrage when he was shown killing a firefighter. Realizing that the public, including more than a few first responders, was not amused, the contrite Flames quickly consigned Scorch to the ash heap of history. Fighting in the NHL is down dramatically since the start of the 2014-15 season and one of the better bouts was the dressing room battle between Canucks goalie Eddie Lack and his shirt. With the ALS Ice Bucket Challenge sweeping the land, the iconic Hockey Night in Canada commentator got in on the act in grand style, naturally. ​Not to be outdone, Coyotes enforcer/Twitter favorite Paul "BizNasty2point0" Bissonnette iced our Best Bucket Challenge honors with this elaborate, breathtaking video. 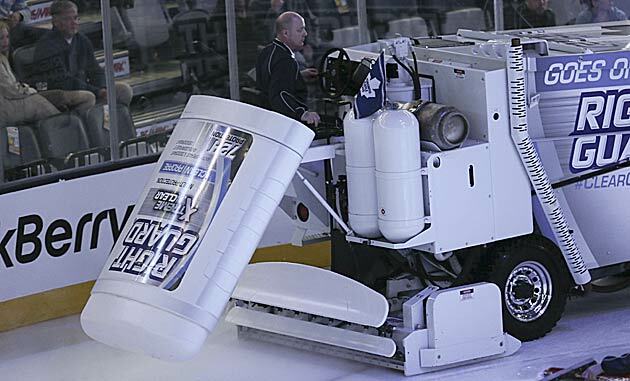 Eyebrows and more than a few snickers were raised on Twitter when the Leafs, a team that has frequently emitted the stench of mediocrity and worse during its 47-years-and-counting Stanley Cup drought, introduced its new Zamboni with a giant deodorant stick attached to its end. Naturally, Toronto got off to a less-than-fragrant 9-8-2 start to the season and placed coach Randy Carlyle on the hotseat. There are few tests of character and endurance quite like rooting for the Maple Leafs and every man's sanity has its limit, it seems. Avid fan/video blogger Steve Dangle came unglued while his favorite team was being raked by the Nashville Predators, 9-2, on Nov. 18 ... with hilarious results. Fired by the Senators less than two seasons after winning the Jack Adams Award as 2012-13 coach of the year, Paul MacLean waxed philosophical at his entertaining farewell press conference. Quoting Taylor Swift's "Shake It Off", clarified his inflammatory earlier statement "All I know is I'm scared to death no matter who we're playing ... and sometimes I'm scared to death of who I'm playing" by saying "I thought we lost four games in a row. I didn't think we lost our sense of humor." He also received a sudden, boisterous show of support from a woman who crashed the proceedings. It was a fitting end for a coach whose tenure often had a touch of the bizarre to it, thanks to his doppleganger.